Matt Hamilton joined the Robert T. Jarvis Law Firm in August, 2012, after more than two years as an assistant district attorney prosecuting cases in Grayson County and Collin County. He is a 2010 graduate of Creighton University Law School in Omaha, Nebraska, where he won the Moot Court Competition and was voted best orator. With an undergraduate degree in Accounting and an MBA in Finance, Matt is well equipped to handle any case involving money or finances. 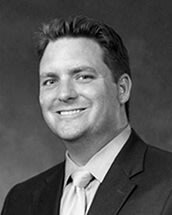 Prior to entering law school, Matt earned a Bachelor of Business Administration in Accounting at the University of Iowa. After graduation, he was hired by a Fortune 500 Company as an accountant overseeing and managing multi-million-dollar accounts. Experience in the financial world combined with business and law degrees gives Matt a unique perspective in his ability to evaluate and defend complex financial cases. While prosecuting in the district attorney's office, Matt personally tried numerous cases to juries. In less than two years, he was chosen to assist in a capital murder trial, and was one of the youngest assistant district attorneys to successfully try a capital murder case. As a prosecutor, his responsibilities included reviewing and processing or rejecting cases filed by police agencies; conducting plea bargain negotiations; and preparing cases for jury and bench trials. The experience he gained as a prosecutor gives him a distinct advantage in defending persons charged with criminal conduct. As a defense lawyer, Matt has represented clients charged with a wide range of misdemeanor, felony, and federal crimes. With an educational background in accounting and finance, he is uniquely qualified to handle fraud, embezzlement, and other cases involving mishandling of money. His experience as both prosecutor and defense lawyer gives him a distinct advantage in defending DWI, assault, drug cases, and many other criminal charges. A fearless, forceful and innovative defense lawyer, Matt Hamilton is committed to fighting for his clients and finding the best resolution for a positive outcome.